Abstract: People try to manage the environmental risks about hundreds of years. The first legislative act aimed at reducing environmental risk, can be considered the decree of the English king Edward I signed more than seven hundred years ago, in 1285, This decree was forbidden to burn in the ovens, served for firing and drying bricks, the so-called “soft” coal, which produce many pollutants. A review of environmental risks becomes very important in time of “Greenifying economics”, around the world. Environmental risks the majority of researchers defined as the probability of occurrence in the natural environment of such violations (effects) with anthropogenic intervention, which can be unfavorable for the continued functioning and existence of ecological systems (6). Another definition of environmental risks is given in work of P.A. Vaganov(4), where he describes how the environmental risk should be to understand under the totality of risks to the health, life risks and threats as habitat. The ecological risk assessment is usually considered in terms of biomedical concepts about the threat. The ecological risk assessment are usually considered in terms of biomedical concepts about the threat to human health and ecosystems. These estimates are usually obtained from a consideration of the chemical and biological data pertaining to a particular region. A review of the scientific publications shows that increasingly, this approach to determining the risk of adverse events, which takes into account not only the probability of this event, but also all its possible consequences. The probability of the event or the process here is one of the risk components and measure the consequences (damage) to others. This two-dimensional definition of risk is used in quantitative risk assessment. But there is another approach to the definition of risk is multidimensional. It is based on many factors responsible for the perception of risk involved in making risk-related decisions. These factors identified by psychologists, are qualitative in nature. To compare the expression of these factors, they are credited with notional units (for example, on a five-point system: if this factor is considered to be very strong, his weight taken for 5, and if very weak, then for 1). After that, all weights are summed up, this is the essence of the so-called psychometric approach to risk, using its multidimensional definition. A multi-dimensional definition is of a qualitative nature, it is useful in identifying people’s priorities as they relate to the totality of dangerous events or processes. The term «risk» is generally used only when there is a possibility of negative consequences. In some situations, the risk due to the possibility of deviation from the expected outcome or event. The outcome of an event can be one or more consequences. The consequences can range from positive to negative. However, with regard to the security aspects of the consequences are always negative. Consequences can be expressed qualitatively or quantitatively. Environmental risk is the likelihood of negative changes in the environment. These changes can be caused by anthropogenic impacts or other impacts on the environment. Under the concept of «environmental risk» is often understood as likely causing harm to the environment, which is expressed in the form of potential losses over time. 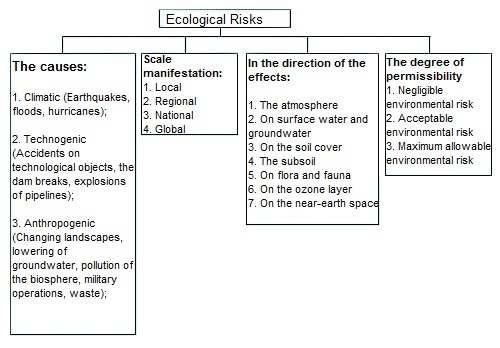 Environmental risk, as one type of risk can be classified based on the basic risk classification, scale of manifestation, the degree of validity, prediction, possible, prevent, possible insurance. Based on the causes, one can imagine this classification of environmental risks (Picture 1). Natural-environmental risks — due to changes in the natural environment. The risk of catastrophic effects — associated with changes in the environment as a result of technogenic catastrophes, accidents and incidents. Ecological-political risk — risk caused by environmental protests. Environmental-economic risks — related to the financial and economic activities. Based on the classification of environmental risks, you can select the entities whose activity is a source of danger to the environment, and to take measures for prevention of risks, protection of the facility from exposure to environmental risk factors. Environmental risk assessment can be carried out at all levels — from point to global. Under the environmental risk assessment always means qualitative and/or quantitative assessment of the actual or potential impacts of contaminants to the environment. Environmental risk assessment is the identification and evaluation of probability of events having adverse consequences for environmental health activities of the enterprise and caused environmental pollution, violation of environmental requirements, emergency situations of natural and technogenic character. determination of the probability of emergency situations of every kind. Processes for managing environmental risks are important results of the study of perception. The identified priorities of public concern the state of the environment should be taken into account in the preparation of the necessary environmental measures. Risk prevention or reduction should take into account not only quantitative but also qualitative characteristics of the risk which is caused by different factors and mechanisms of risk perception. To prevent or reduce the risk are developed are many and varied documents, the scope of which may be limited to any one company, and can spread to the whole country. These documents include legislation and regulations aimed at protecting health, improving working conditions, reducing pollution of the environment, ensuring road safety, the standardization of quality of goods, etc. All the famous inscription on cigarette packs «Ministry of health warns: Smoking is dangerous to your health» is an example of the simplest measures to reduce risk. In recent years there has been a clear tendency to regulate environmental risk through legislation, and at the highest levels. Risk management — the broad concept of the theory of risk. It solves complex tasks related to the regulation of the effects on the environment and humans. Risk management uses information about hazard identification and risk assessment together with information about technical resources, social, economic and political variables, to implement control of choice or decision-making on measures to reduce or remove the risk. The implementation of the design and implementation of policies and strategies in the areas directly related to the health of the population. To assess the effectiveness of managerial decisions has often used valuation techniques — the «risk — benefit», «cost — benefit», «cost — effectiveness», etc. to identify priority areas for investments aimed at reducing risk and risk reduction. First is a comparison of the results of the risk assessment for a given situation and the corresponding criteria. After this comparison are the options for reducing risk, each of which is estimated to account implementation costs. Evaluation of options is an iterative operation is repeated until then, until the optimal solution. A significant stage of the search process options for risk reduction is the forecasting of the current situation and simulation of the behavior of the object. Under the scientific Outlook to understand the statement in the form of probabilistic statements about dependent on uncertain or unknown factors the behavior of some system in the future made on the basis of studying and generalization of experience of the past, using intuitive ideas about the development of this system in the future. Scientific predictions are made by experts and specialists in this area. Expert assessment are issued in the form of qualitative characteristics and quantitative values of the probabilities of the considered events, or processes related to a certain length of time. Currently there are several dozen methods of expert estimations, the most famous of them is the collective discussion and agreement according to Delphi method. The Delphi method was applied, in particular, when analyzing possible violations of the integrity of containers in radioactive waste repository in the nuclear center Hanford of the United States. This method is widely used in making risk-related decisions. Among its advantages are convenience and visibility of the graphical representation, as well as a significant simplification of the calculations on computers. 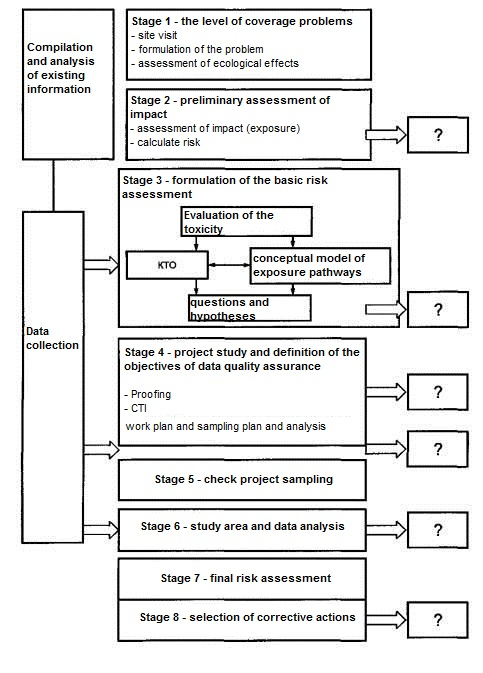 Picture 2 shows the iterative process of the overall assessment, analysis and risk reduction. Picture 3 shows the basic scheme of assessment in the field of risk management, allowing you to spread out on the main stages of the whole system of risk management. 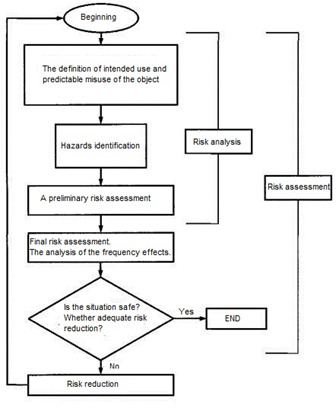 Picture 4 presents the process of ecological risk assessment. The sign «?» denotes the MPR at this stage. The basic scheme of risk assessment in environmental management should describe the basic elements of the process for scientific assessment of the negative impact of this factor on the ecosystem or ecosystem components. The basic scheme draws Parallels between the natural environmental effect and impact assessment by combining the two assessment processes in the analytical phase between the phases of problem formulation and risk characterization. In the formulation of the problem, the expert sets goals, breadth and focus of the evaluation. The organization responsible for the assessment, determines the final point of assessment (WHO) in the form of exact expressions valid values of environmental indicators (environmental resources or values) that need to be protected. Endpoint measurements (LPS) is a measurable environmental characteristic that is associated with the assessed characteristic, selected as a WHO. In fact, LPS is a representative characteristic (property) of an object, which, in fact, measured on the basis of which conclusions are made about the characteristics of WHO. For example, the results of measurements of pollutant concentrations in water compared with the concentrations of which from documentary sources it is known that they can lead to death of sensitive aquatic organisms. On this basis we can conclude about the risks for the structure of aquatic (water) community. As a consequence, the LPS includes and measurable effect, and measurable impact. USNA — the highest level of exposure at which the adverse effect does not appear. Is measured in units corresponding to the Doze or LCCI. If RR is less than 1, it means that a particular pollutant will not cause adverse environmental impacts. If multiple pollutants are able to cause environmental damage identified in the control plot, it is necessary to determine their joint effect on the organisms (receptors) that can be subjected to simultaneous impact, and lead to Toxicological contamination. The amount of R is called the hazard index (AI). If RR is less than 1, it means that the group of contaminants will not cause adverse environmental impacts. However, even if RR, and IO less than 1, this does not mean complete absence of environmental risk. If there is a potential of causing environmental harm, these calculations can be used to exclude from further consideration those contaminants and how they impact the risk which is insignificant. USNA 1 — the greatest level of lack of adverse effects of the i-th pollutant in units appropriate Doze. 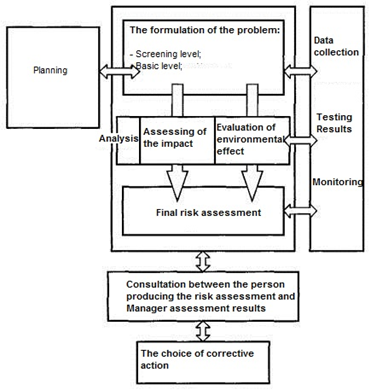 If in the assessment of risk at a screening level to determine what adverse effects may occur at concentrations below the specified value, the group by risk rating and the risk Manager needs to set a limit on discovery or to continue the evaluation in stages 3-7, where the acting concentration will be determined using other information. Environmental risk management is provided through the development and application of normative legal acts which establish the environmental and legal responsibility. damage caused to the property of citizens. Since 1997 in the Russian Federation, the laws and regulatory legal acts concerning questions of licensing of hazardous production facilities, mandatory environmental insurance, the calculation of fines and revocation of licenses, etc. Currently the latest edition of the Federal law of 10 January 2002 № 7-FL «On environmental protection» (as amended on December 28, 2016) (version effective from 1 March 2017). When determining environmental safety of man and society, the natural environment must consider the environmental hazards and threats to environmental security in the complex, taking into account their interconnections. Thus, the concept of «environmental security» is seen as a condition of protection of the natural environment and people from human impact and emergency situations of natural character, their consequences. — performance indicators for environmental solutions in the system of environmental management appropriate to the rate of change of efficiency of functioning of the analyzed system. In connection with human activity has mainly come from two of the most common trends in risk management: risk can be reduced through the introduction of protection systems, but not reduced to zero; risk increases as the continuation of the activities so that over time the value of losses is greater than the magnitude of the benefits from the exploitation of a particular object. Research of the observed phenomena contribute to the development of solutions that reduce adverse impacts of natural disasters. Assessment of environmental risk is reduced to a number of stages: 1) identification of sources and types of negative impacts; 2) release of potential anthropogenic and natural risk factors (excess toxicants, lack biopiling substances, etc. ), contributing to the emergence of stress for ecosystems; 3) definition of environmental objects (targets) that can influence risk factors; 4) consideration of possible exposure routes; 5) development of a conceptual model for the development of stressful situations. 1. Federal Law of January 10, 2002 No. 7-FL "On Environmental Protection" (as amended on December 28, 2016) (edition effective March 1, 2017). 2. GOST R 54135-2010 Environmental management. Guidance on the application of organizational security measures and risk assessment. Protection of ecological natural areas. General aspects and monitoring. GOST R 54135-2010. NATIONAL STANDARD OF THE RUSSIAN FEDERATION. Ecological management. GUIDELINES FOR THE APPLICATION OF ORGANIZATIONAL SAFETY MEASURES AND RISK ASSESSMENT. PROTECTION OF ENVIRONMENTAL NATURAL ZONES. General aspects and monitoring. Environmental management. Guidance for organizational safeguards application and risk assesment. Native zone protection. General aspects and monitoring. ACS 13.020. The date of introduction is 2011-09-01. 3. GOST R 14.09.2005 "Environmental Management: Guidelines for Risk Assessment in the Field of Environmental Management". 4. Vaganov P.A., Man-Sung I.M. Environmental risk. - St. Petersburg: St. Petersburg State University, 1999. 5. Space geography. Dialogue between nature and society. Sustainable Development / V.V. Kozedorov, V.A. Sadovnichy, L.A. Ushakova, S.A. Ushakov, Ed. V.A. Gardener. - Moscow: Moscow State University, 2000. 6. Sikirinov SI. New Trends in American Practice for Assessing Environmental Risks // Assessment and Management of Natural Risks. - Moscow: Ankil, 2000. 7. Kolluru R.V. Health Risk Assessment: Principles and Practices // Risk Assessment and Management Handbook. For Environmental, Health, and Safety Professionals. New York, 1996. P. 123–151. 8. INDICATORS OF ECONOMIC EFFICIENCY OF ENVIRONMENTAL MANAGEMENT. Cher M.L., Kovaleva O.V., Mironov L.V., Pikalova N.A., Opryshko E.L. in digest: The latest concepts of research: experience, tradition, innovation, effective development strategy materials of the I international research and practice conference December. Scientific publishing center “Open knowledge”. 2016. С. 26-32. 9. IMPROVEMENT OF THE SYSTEM OF ENVIRONMENTAL - ECONOMIC LAND MANAGEMENT. New Science: Experience, Traditions, Innovations Sher M.L., Kovaleva O.V., Mironov L.V.. 2016. № 6-1 (89). С. 56-57.